This morning, the Macau Daily Times reported again on the cruel fate greyhounds face at the Canidrome dog track. This track has no adoption program, and hundreds of greyhounds are killed every year. 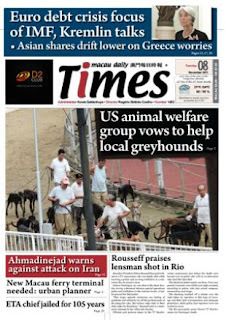 The Daily Times has doggedly covered this problem, and is giving the Canidrome greyhounds a voice for the first time. Their report today ran as the lead story on the front page, and is based in part on an interview with GREY2K USA Board Member Charmaine Settle. "I was at the Canidrome around 3pm in the afternoon when the dogs are let out of their kennels. I felt so sad looking at the dogs eyes as they passed by me knowing every one of them will probably be killed within a matter of months for no reason. It certainly is a one way death sentence when they are sent from Australia to Macau where they are exploited, suffer and die for the sake of a bet." Charmaine also took several photographs at the Canidrome, including a close-up of a greyhound we believe is named Brooklyn. According to the track's website Brooklyn last raced two nights ago, although I fear he could be killed at any time. We are committed to helping these dogs. Last year we launched a petition urging the President of the Civil and Municipal Bureau in Macau to make positive changes, and already more than 8,000 people from across the world have added their names as signatories. If you haven't signed this petition yet, please do so today. We are also preparing a new campaign to raise awareness about the greyhounds at the Canidrome, and will be announcing further details soon. Dogs like Brooklyn can't afford to wait any longer. A modern society has laws to protect animals. The government of Macau wants Macau to become a an example of a modern society, therefore the government must create a law to protect animals from unbridled savagery of the business. 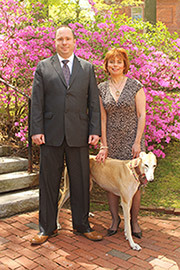 It is necessary to prohibit the slaughter of greyhounds which already are unable to make money for their owners. Let's demand an end to greyhound racing. The government of Macau wants Macau to become a modern society, therefore the government must create a law to protect animals from unbridled savagery of the business of the greyhound racing. Let's demand an end to greyhound racing in Macau. End the cruelty of Dog racing on Macau. Adopt these dogs out . Stop cruelly racing them. Val. please let these dogs be adopted. anything else else is just cruel and unnecessary. Is Brooklyn the Greyhound Running Out of Time?